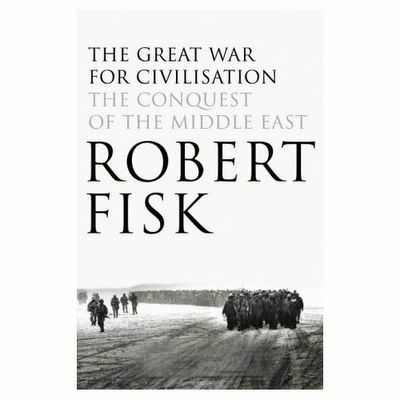 "Journalist Robert Fisk of the UK-based publication, The Independent, recounts his experiences traveling around the world and living in the Middle East, Fisk speaks on history and geopolitics in the Middle East. His focus is on the problems with journalism in the United States, which include an over-reliance on what government authorities say and the common mode of reporting 'from Baghdad' but entirely within the confines of a hotel room. Using newspaper articles and speeches from politicians, Fisk illustrates the lack of concern for Iraqis as human beings. Fisk's talk also looks at the Armenian genocide, which was downplayed in Western media. After the talk, Fisk fields questions ranging from the rumors of civil war in Iraq to the situation in Lebanon." "During the thirty years that award-winning journalist Robert Fisk has been reporting on the Middle East, he has covered every major event in the region, from the Algerian Civil War to the Iranian Revolution, from the American hostage crisis in Beirut (as one of only two Western journalists in the city at the time) to the Iran-Iraq War, from the Russian invasion of Afghanistan to Israel’s invasions of Lebanon, from the Gulf War to the invasion and ongoing war in Iraq. Now he brings his knowledge, his firsthand experience and his intimate understanding of the Middle East to a book that addresses the full complexity of its political history and its current state of affairs. Passionate in his concerns about the region and relentless in his pursuit of the truth, Fisk has been able to enter the world of the Middle East and the lives of its people as few other journalists have. The result is a work of stunning reportage. His unblinking eyewitness testimony to the horrors of war places him squarely in the tradition of the great frontline reporters of the Second World War. His searing descriptions of lives mangled in the chaos of battle and of the battles themselves are at once dreadful and heartrending." I doubt it... U.S. Marines are trained by the U.S. Marines Corp.